When I decided to attempt a version of Art Kane’s iconic 1958 A Great Day in Harlem photograph here in Birmingham I chose 11 February 2019 as I wanted to get on with it. The long-range weather forecast was OKish so I went for it. The story of the original picture of jazz musicians in front of a Brownstone in Harlem has just been re-published and given it's just over 60 years since that shoot and the fact that the Birmingham scene is so strong it seemed like a good idea to do it and celebrate. In the lead-up the stars seem aligned. Just before I left for a work trip to New York I received a second hand copy of Milt Hinton’s first book Bass Line. Milt was a great photographer as well as one of the best bassists of his time. The book was only £11 from a London dealer. When I opened it the flyleaf was inscribed “To Campbell Burnap" and signed by Milt with his signature “Million Thanks to You” line which includes a little notated bass line. Milt, of course, was in the original picture. I took both of these as good omens and sure enough on the morning of the 11th the weather was fine – almost too fine as sunny conditions can cause difficult shadows. I’d invited over 100 musicians, promoters and supporters and put the word round on social media. In 1958 it was Art Kane’s first professional shoot (he was then an art director) which was a brave thing to do. This was by no means my first professional shoot but it was the first time I’d shot such a big group – assuming enough people turned up! I’d set the time as 10am – the same as in 1958 – not to match it but because some jazzers thought that was the best time on a Monday when other commitments would be less. Of course this was OK for some but for plenty of others it wasn’t. There is probably not one “best” time but if we did it again I think we’d try a Sunday. But all was fine – the weather and the turnout. 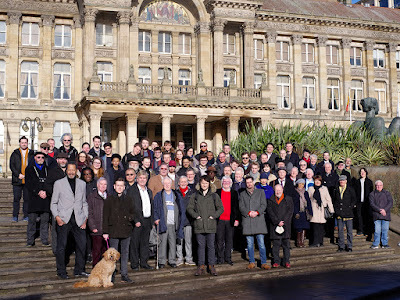 We had over 70 people (more than in Harlem) coming to the steps in front of the Council House in Birmingham – the most iconic location I could think of which gave a sense of place as well as providing the possibility of arranging people so that they were all visible. Fortunately, like Kane, I had enlisted the support of some other photographers I’d worked with before. George Archer, a photography student at BCU, I knew would be fine actually pressing the shutter once we’d arranged and framed the shot (I wanted to be in the shot myself). 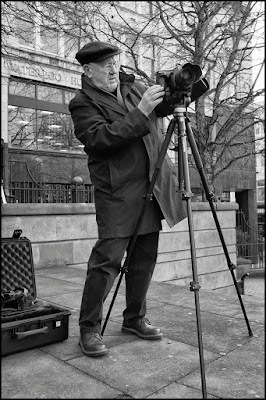 Also invaluable was Emma Jo Tucker who like George has assisted on my self-portrait projects – she was assiduously making sure we had names and contact details from each of the people in the shot. And Garry Corbett was there making sure we got some shots of what was going on in the melée of people. In fact everyone was very patient and well up for making sure the shot worked. The group assembled naturally on the steps and it only needed a small bit of re-organising and to make sure everybody could see the camera. We shot several frames bu the first one was fine. Even Sarah Raine’s dog depping for her under the watchful eye of Lyle Bignon looked at the camera. 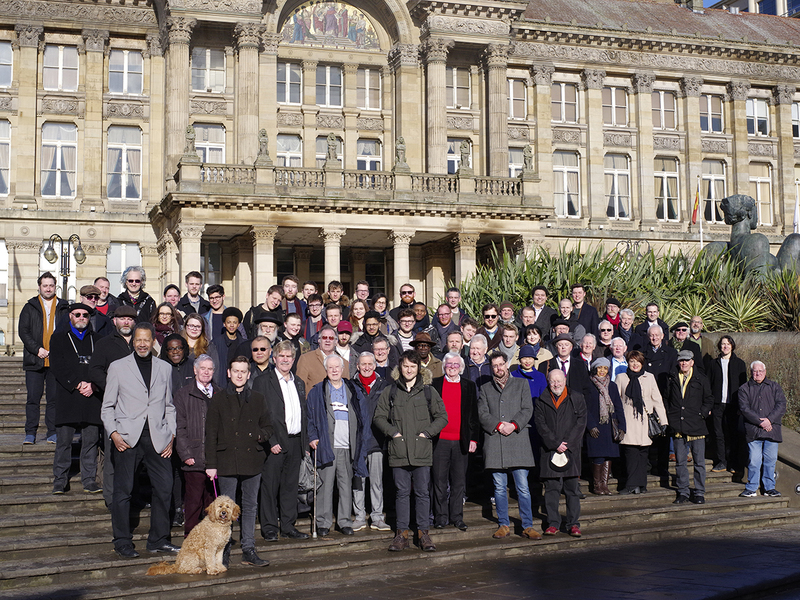 I think it turned out fine but judge for yourself and see who you can spot in the crowd – I’ll be posting the picture on the Jazz in Birmingham website together with a list of all the people in it. There’s an amazing range of jazzers from 16-year-olds to people who have stopped counting the years! And all of jazz is represented from the traditional end to contemporary. Of course many people could not make it – Soweto Kinch messaged to say he was stuck in Scotland and Xhosa Cole who was not feeling well only got there after we finished. But it went so well that we will do it again and then who knows how many we will get. Thanks go to The Flash Centre Birmingham for sponsorship – they lent a medium format Pentax camera to make sure we got a really high-res image. Leamington based promoters In The Moment are showing the Jean Kent film "A Great Day in Harlem" (1994) telling the story about the original 1958 photograph, on Sunday 7th July at the Spa Centre. It will be followed by live jazz in the balcony bar. More details nearer the date.